The Radeon™ Pro WX 9100 workstation graphics card is the ultimate, cutting edge graphics solution for all professional workloads from design and rendering to virtual reality. Based on the "Vega" GPU architecture, this card ushers in a wealth of bleeding-edge technologies like the High Bandwidth Cache Controller (HBCC), a radically new GPU memory hierarchy allowing previously untapped flexibility, and new frontiers in real-time visualization with hyper-realistic rendering techniques. With the "Vega" architecture's incredible throughput and optimized load-balancing, filmmakers will be able to integrate game engines into the workflow to create high-fidelity real-time VFX pre-visualizations to help inform on-set decisions on-the-fly. 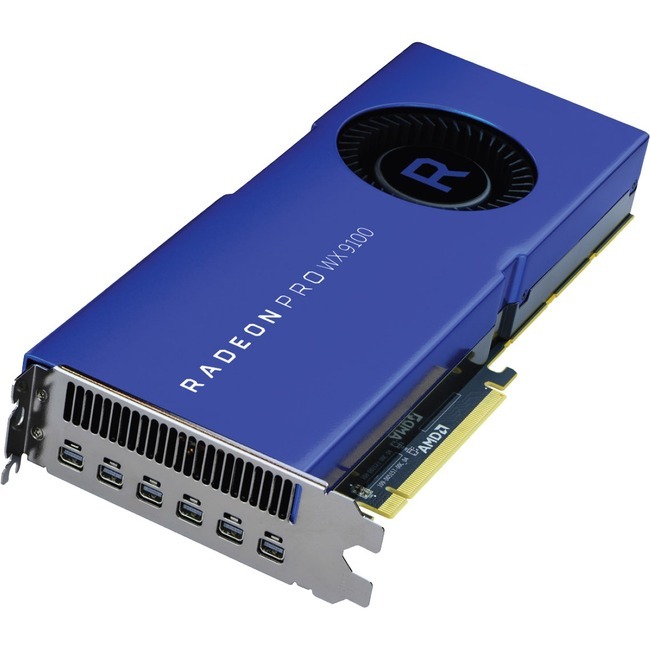 And when it is time for post-production, the Radeon™ Pro WX 9100 workstation graphics card can handle 8K resolutions with ease.